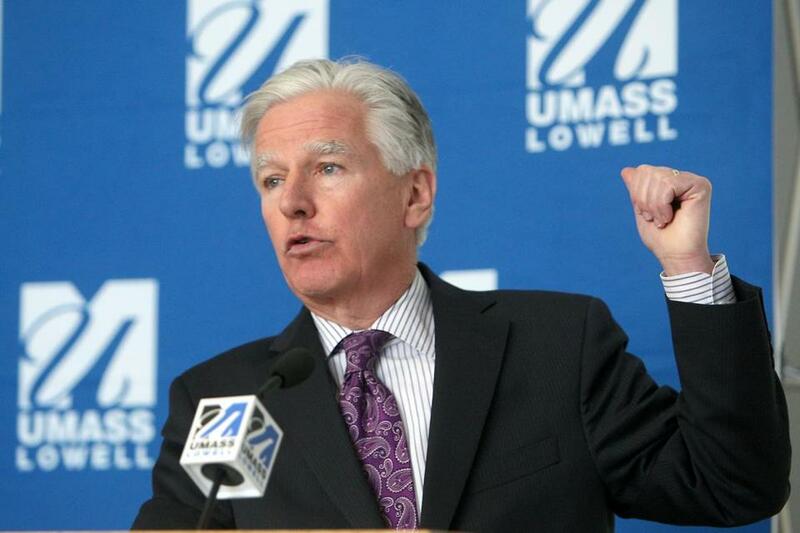 University of Massachusetts president Marty Meehan is the target of an ad campaign launched by adjunct faculty at UMass Lowell who are unhappy with their lack of health insurance. The University of Massachusetts Lowell’s adjunct faculty union has launched a blistering ad campaign targeting beleaguered UMass president Martin T. Meehan, accusing him of “hurting students and the city of Lowell” by failing to resolve a major contract dispute. In the ads, the union complains that UMass Lowell is the only University of Massachusetts campus that doesn’t provide health insurance to adjuncts and that it doesn’t pay them fairly. Meehan, a Lowell native and former congressman, previously served as chancellor of UMass Lowell. “For UMass Lowell to be the only UMass campus that denies health insurance to their adjuncts is totally unethical,” Sara Backer, an adjunct professor, says in one of the ads. Meehan is already dealing with a major labor issue at UMass Boston, whose faculty recently took a vote of no confidence in Meehan and halted its search for a new chancellor. The vote came in response to the April 6 announcement that UMass Amherst would acquire Mount Ida College’s 75-acre campus for $75 million, with Meehan’s blessing, at a time when the Boston campus is scrambling for money and trying to pay for major repairs at its own campus. The other ad says the university system is “losing its way” under Meehan’s leadership. “Now another controversy,” a narrator intones. The union is also demanding higher wages, accusing the college of paying its more than 500 adjuncts far less than their counterparts at other UMass schools. Asked about the criticism, Jeff Cournoyer, a spokesman for Meehan, said that the campuses negotiate directly with their bargaining units. “President Meehan supports UMass Lowell’s ongoing effort to bargain in good faith with its adjunct faculty union,” he said. The labor dispute comes as Meehan is set to enter into a new contract on July 1 that could boost his total compensation to nearly $1 million in 2023, Cournoyer confirmed. Earlier this year, UMass agreed to a contract with Meehan to extend his time at the helm of the university system until June, 2023, Cournoyer said. Meehan’s original contract ran through June 20, 2020. Meehan could make north of $964,000 in total compensation in the final year of his new contract if he hits certain goals and receives the full amount of performance-based pay possible under the agreement, he said. Gillette said the university has held more than 50 meetings with union representatives and has sought third-party mediation. “UMass Lowell has made multiple offers to the adjunct faculty union that include pay increases and options for health care coverage, all of which have been rejected by the union leadership,” Gillette said. James Moran, a senior adjunct professor at UMass Lowell, said the school’s health insurance proposal is sorely inadequate. Union members have not yet determined how much they’ll spend on the campaign but a union spokesperson described it as “very sizeable,” including billboards, TV, radio, video, and digital ads on several platforms including Facebook, Instagram, YouTube, and Pandora. The union has reserved inventory through Labor Day and plans to continue beyond that if necessary, according to the spokesperson. Jonathan Wheatley, 61, has been an adjunct professor at UMass Lowell since 1986. The music professor said he didn’t receive health insurance for the first 10 years he worked at UMass Lowell, which proved especially difficult when his wife was diagnosed with cancer in the early 1990s. He began to receive health care benefits when he started working a second adjunct position at Berklee College of Music in 1996. Wheatley said he would expect Meehan, who served as a US representative for 14 years, to sympathize with the adjuncts’ plight. “I just don’t see how people lose track of their roots, their working-class roots, their loyalties and people they care about,” he said.